1) Ask yourself if you’ve waited long enough to ask and if you’re deserving of a raise. Wait to ask until you’ve been on the job for at least six months and, if possible, after you've accomplished something valued by leadership. Do not ask for a raise after making a major mistake, missing a deadline or failing to meet your goals. Consider whether your boss values you enough to pay you more. If not, expect a “no” answer. 2) Think about how to approach your boss. Determine what is most important to your boss and how he or she tends to respond to requests. 3) Schedule a meeting with your boss to find out what he or she considers as criteria worthy of a raise for someone in your position. Ask, “How can I earn the maximum amount for my level and years of experience?” Write down what you both agree to, then give your boss a copy so there is no confusion later. 4) Raise your profile within the company. Build your reputation as an emerging leader and as a highly effective employee. 5) Document ways your work has added value to your company’s bottom line. Raises are usually tied to performance and bosses often forget your accomplishments unless you remind them. Present the information to your boss in a weekly or monthly report and compile all the top accomplishments into one document for your raise meeting. Include quantifiable accomplishments, such as dollars saved, number of products sold, or donations raised. 6) Research whether your company is financially healthy enough to pay you more. If you work for a public company, you can find this information in the annual report or on the investor relations web site. If your employer is in the midst of massive layoffs, delay your raise request until business picks up. 7) Research the company policy manual to learn rules governing raises and promotions. Some companies do not allow either except during annual review periods. 8) Learn the going rate for your position. Check salary sites, such as Glassdoor.com and Salary.com to see what others in your position and area make. Keep in mind that people who work in nonprofits, education and small companies typically make less. Also realize that those paid at the high end tend to have extensive experience. Document your research in case you need to show your employer. Also consider using salary information you've learned from coworkers, but realize telling your boss how you found out what others make may get the blabbermouth in trouble. 9) Don’t wait for your performance review. Overall salary decisions are usually made during the annual budgeting process. Ask then. 10) Practice your raise request so you’ll sound confident and prepared. Focus on what you deserve, not on why you need the money. Bosses don't want to hear about your money woes. If you started at low pay during the recession, say, "I know that I joined the company during the down economy. I’m hoping we can use this coming year to get me closer to the going rate for my position, which my research shows is $_. How can we make that happen?" Stay silent after making your request to put the pressure on your boss. Realize that you may not get an answer during the meeting. Your boss may need to get a superior’s approval first. If offered a better salary elsewhere, consider using the offer to get your company to increase your salary -- they may to try to keep you. Don't threaten to quit if you don't get more money ... the employer may let you walk! 11) Play the long game. If the boss says “no”, seek a different perk, such as a better title, a one-time bonus, additional vacation days, paid parking, a reserved parking space, flex-time or telecommuting. Ask for feedback about why you can’t get a raise now. Say, “I'm disappointed that an increase is not possible this year, but I'd like your feedback on my value to the organization and how I can qualify for a raise soon." You may need to complete additional assignments, schooling, training or professional development to be eligible for a raise. If necessary, request a different career track to put you on the faster track to a higher salary. If the timing is right, ask for a raise! Even if the answer is “no”, most employers will respect you for trying. Give this guidance a whirl because more money may be in your future! Look to us for expert services! We also provide LinkedIn training and services for companies to further their business. 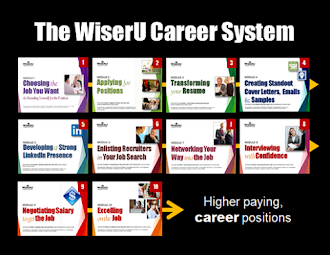 To learn more or to get started, visit Services or contact Sue at 847-606-5160 or email Susan @ wiseru.com.